Do you know what it feels like for a rock’n roll girl? Joan Jett started her career in the 1970s, when rock’n roll was virtually all male territory. The bad reputation associated with the movement was perceived as masculine and virile. Man’s business. Definitely not girly stuff. Even those who embraced femininity – David Bowie, Mark Bolan and other glam artists – happened to be male. Joan Jett describes herself as a feminist, and she’s a founding member of the all-female American teenage rock band the Runaways. Bad Reputation follows Joan from her early days as she challenged the notion that “girls don’t play rock’n roll”, all the way to the present, as the 60-year-old artist collects awards and widespread recognition for a very distinctive career. The early days where tough. She was spat on, her head cracked open and rib broken for being a female punk rocker. Misogynous criticism was heaped in every corner of the US and Europe where the rock band travelled. They only made it big for the wrong reasons: when they were arrested for disorderly conduct. Iggy Pop thinks that Joan and the Runaways weren’t entirely on their own “there were a lot of women who didn’t want to be like Joni Mitchell. They wanted to rock”. Despite the turbulent years (or perhaps because of it? ), Joan is described as a “time-traveller”. She is now considered a woman ahead of her time, and thereby compared to David Bowie. The documentary blends archive footage with talking heads interviews with Joan and various associates. Iggy Pop and a Debbie Harry with sunglasses permanently attached to her face talk about the significance of the Pennsylvania-born artist. The depravity of the LA’s colourful club scene in the 1970s, which is featured in the beginning of the movie, helped to create the Joan we know. Lisa Minelli’s Camp performance in Cabaret (Bob Fosse, 1972) also had a massive influence on the female rocker, we also learn. At a defining moment of documentary, Joan explains why she shunned motherhood in favour of a “deviant” lifestyle, thereby defining the subversive essence of punk rock itself. 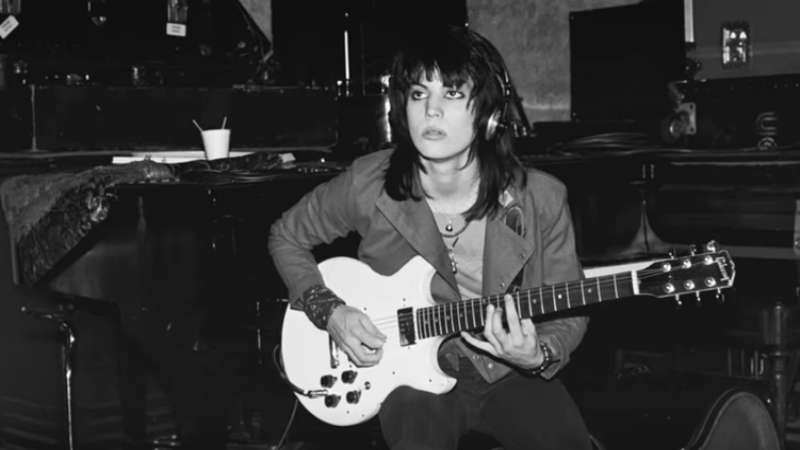 Other highlights of the movie include how Joan Jett survived the “bubblegum music” years, how the recording of I Love Rock’n Roll catapulted her into the mainstream, her relation to Bikini Kill and the Riot Grrrl Movement and much more. All in all, an enjoyable ride through the life of a woman who dodged labels and preconceptions both within and outside the rock world in favour of her individuality. Bad Reputation is out in cinemas across the UK on Friday, October 26th.